this urban community treasure. The 9.3-acre preserve includes Devereux Creek, woodlands and meadows as well as trails, an outdoor gathering area and classroom. The Preserve is protected open space and acts as a gateway to existing and future protected coastal resource areas nearby, via trails linking the Goleta Monarch Grove, Ellwood Shores coastal bluffs, Santa Barbara Shores County Park, the Devereux Slough and the beach. 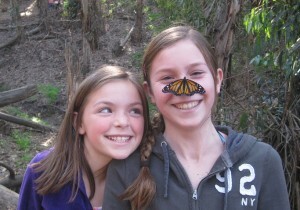 The preserve is adjacent to the largest Monarch butterfly over-wintering groves in California and is enjoyed by as many as 1,000 visitors per weekend during the butterfly season. For many years, the community has appreciated and sought to protect the biologically rich, undeveloped coastal properties in west Goleta. Previously owned by the Goleta Union School District, the Land Trust purchased the Preserve in 1998 for $600,000 using public and private grants and over $50,000 in community donations. The Preserve is now permanently protected and used for the wildlife habitat preservation, outdoor education and links to the coastal trail system. • Planted over 1,000 native plants and removed weeds to improve wildlife habitat. • Built trails and installed log seating. • Collaborated with native plant experts, wildlife biologists, and local educators to maintain the urban nature preserve as a community asset. • Plant more native trees and plants to further enrich butterfly habitat. • Plan for future creek habitat restoration. • Conduct on-going maintenance, such as fire prevention mowing, replacement plantings, trail grooming and irrigation. • Involve the community in caring for the preserve. Unlike most other insects, Monarch butterflies cannot survive a long, cold winter. Instead, they migrate south and spend the winter in roosting spots. In California, they fly to small groves along the California coast. The Monarchs can travel up to 3,000 miles and are the only butterfly to make such a long, round trip journey each year. Amazingly, they fly in masses to the same winter roosts. 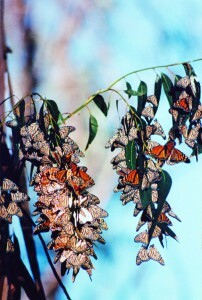 The Monarchs roost in eucalyptus trees, Monterey pines and Monterey cypress. The butterflies need cool areas protected from winds and nearby water to drink, and the Coronado Butterfly Preserve is part of a perfect over-wintering site. As winter ends and days grow longer, the Monarchs become more active and return north to lay their eggs and continue the cycle. Protecting the important Monarch habitat found at the Preserve is critical to the survival of these beautiful and amazing creatures. For more in-depth information on the Western Monarch visit the Xerces Society website. The Coronado Butterfly Preserve is a beautiful natural space open to the public every day of the year from sunrise to sunset. No reservations or admission fees are required—we rely on your visitor donations. 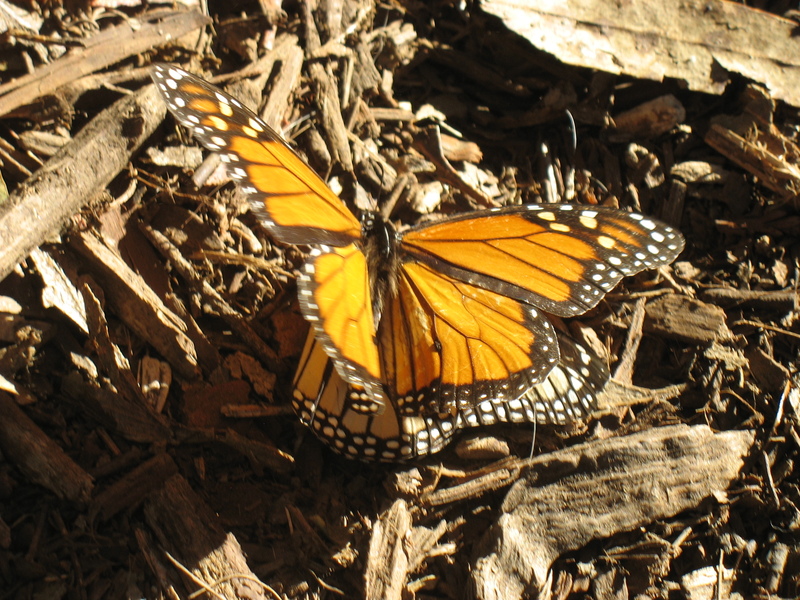 Monarch butterflies migrate to the adjacent Goleta Butterfly Grove for their over-wintering time, which is typically from November through February, with peak numbers usually visible in December and January. It’s difficult to predict wildlife behavior, and every year is different due to a wide range of factors. Even so, we expect to see the first butterflies arrive in late October with almost all butterflies gone by the middle of March. Peak over-wintering time for the Monarch butterfly typically range from December through February. 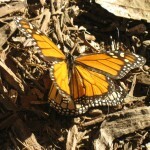 The Monarchs are most easily seen during the middle of the day. They usually hang from eucalyptus branches in amazing clusters when the weather is cool, then flutter around when directly warmed by the sun. Look up in the trees of the Goleta Butterfly Grove for unusual clumps of “leaves”. They just might be butterflies! Check out the Yelp page to hear what people are saying about their experience at the Coronado Butterfly Preserve. We encourage you to add your own review! Directions from the north: Exit Highway 101 at Hollister Avenue and turn right toward the ocean. Turn left onto Hollister Avenue. After .6 miles, turn right at the stoplight for Ellwood School. From the south: Exit Highway 101 at Glen Annie/Storke Road. Turn left over the freeway and turn right on Hollister Avenue. Drive about 1.5 miles to the stoplight at Ellwood School. Turn left into the parking lot. Santa Barbara MTD: Line 25 – Elwood, use Hollister at Via Jero stop. For a view on Google Maps, click here. The Land Trust’s Coronado Butterfly Preserve does not need volunteer support at this time. If you are interested in volunteering at the adjacent Goleta Monarch Butterfly Grove, please contact the City of Goleta at (805) 961-7500 or email [email protected].